Sea Surface Temperature Trends As A Function Of Latitude Bands By Roger A. Pielke Sr. and Bob Tisdale | Climate Science: Roger Pielke Sr. In reading his weblog, we have discussed the variations of sea surface temperature trends as a function of sea surface temperature. Since evaporation is proportional to the exponent of the temperature (see figure at the top of the post), the same change in warm water as in cold water in terms of degrees, would have a much greater effect on the evaporation when the ocean is warmer. Surface wind speed, of course, also has an effect which, since they are typically stronger in the mid- and high-latitudes, would add to evaporation there. However, the sea surface temperatures are expected to be the larger contibutor to evaporation. Since a positive water vapor radiative feedback requires more water vapor being in residence in the atmosphere, warmer ocean surface temperatures must be the major source of this water. Colder water would have less input. Land use change (e.g. irrgiation) certainly could contribute added water vapor also but this is certainly a significanly smaller contributor. As a first step in such an assessment, Bob has generated the analyses presented below (for the trends from 1982 to 2011 and from 2003 to 2011). 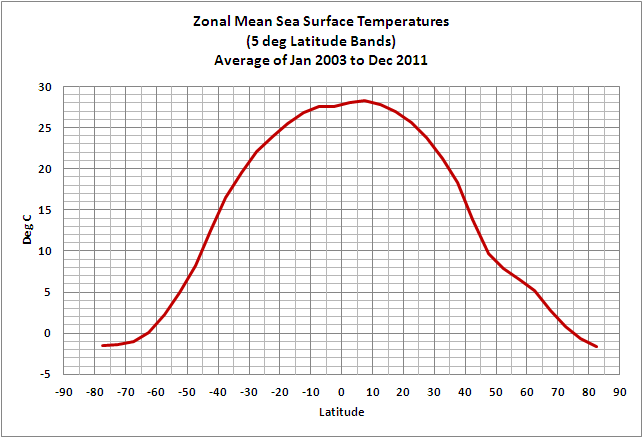 The first two plots are zonal mean sea surface temperatures in 5 degree latitude bands for the two time periods. The two tables include the linear trends over these time periods, while the spatial map of the trends is in the last two figures. Clearly, a more detailed analysis is needed than just averaging by latitude bands since within bands there are regions of higher and lower SSTs (e.g. cool temperatures even around the equator associated with upwelling). Nonetheless, this is a start to assessing the changes in evaporation that would be expected due to warming or cooling of the SSTs [if anyone is interested in performing a more detailed analysis, please contact Bob and I]. There are several interesting results in our preliminary study. 1. 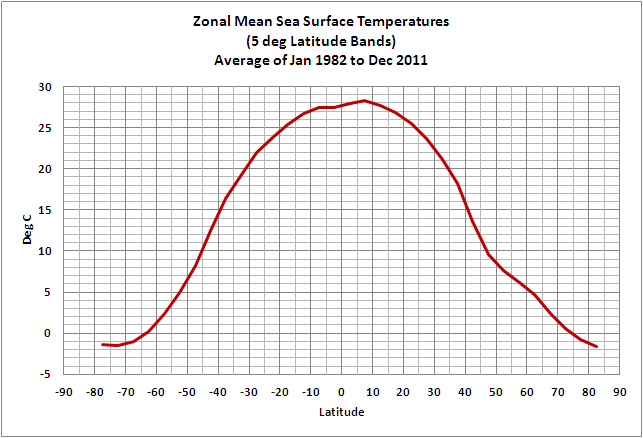 The trend for the period 1982 to 2011 for the latitudes 24N to 19S is quite small (~+0.06 C per decade). This is where the highest SST evaporation presumably occurs. 2. 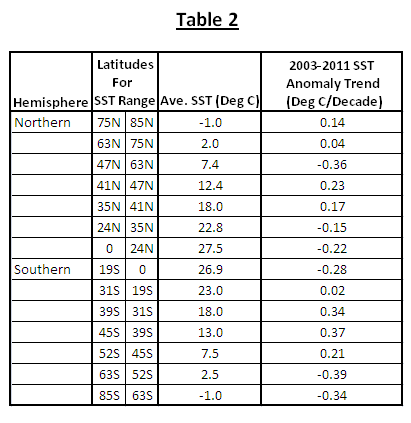 There is a substantial latitudinal variaton in the SST trends. For example, north of 34N to 75N, the trend for 1982 to 2011 is ~0.22C per decade, yet for 45S to 85S it is no larger than+0.09C per decade and is even slightly negative south of 52S. 3. For the period 2003 to 2011 (which is chosen since this is also the period where the Argo network had sufficient global coverage), The trends were quite variable (undoubtedly due to the shorter time period). The negative trend south of 52S continued and is larger (~0.36 C per decade). 4. In terms of the ocean region with the higher SSTs, from 35N to 19S the trend is negative (ranging from -0.15 to -.28C per decade). This trend would result in a reduction of evaporation into the atmosphere. The analysis that we present in this post, although a first-cut, provides the interesting hypotheses that the water vapor increase in the atmosphere may be less than concluded by the IPCC since the ocean surface temperatures have not warmed much since 1982, and were even cooling more recently. This cooling could be attirbuted to the La Ninas during this time period (see the bottom figure), but the atmosphere responds to the magnitude of SSTs regardless of the circulation dynamics that caused them.